A delivery man places a cardboard box on a home's front porch then rings the doorbell before leaving. 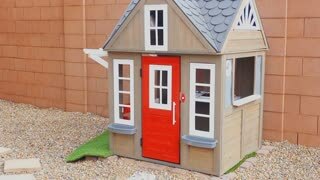 SB0056 A little blonde boy rings the doorbell on his playhouse in the backyard of a typical Arizona neighborhood. Phoenix suburbs. 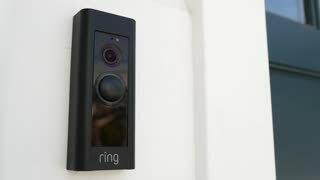 Ring Doorbell lights up and records once doorbell is rung. - For editorial use. Ring Doorbell lights up a blue ring once doorbell is rung. - For editorial use. 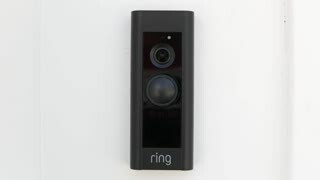 Frontal angle of Ring Doorbell as left hand comes and the Ring records video. - For editorial use. Frontal shot of Ring Doorbell as it lights up once touched. - For editorial use. Ring Doorbell records video once doorbell is rung. - For editorial use. 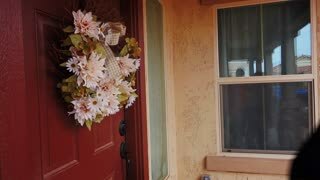 Woman Rings Vintage Doorbell Before Entering House. Man Rings Vintage Doorbell Before Being Greeted and Entering House. Man Opens Hotel Door With Card Focuses On Bed. Close up shot showing a man's hand pulling the door handle and closing the door. Mans Arm Opens Hotel Door With Card And Door Swings. 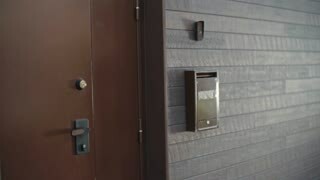 Close up, steady shot showing a mans hand opening a hotel room door with electronic card lock. Man Closes Hotel Room White Door Close Up. Steady, close up shot showing a man's hand closing a hotel room door bolted with electronic card lock. A person opens the door by entering a code of numbers. Dolly Motion View of Doorbell Camera Watching Man Ring Doorbell. Camera tilts down lookign at intercom unit on building. Young man finger pressing a doorbell. 1940s: Young man rides past house on bike. Young man rings doorbell. People come outside. People wave. 1950s: Delivery truck parked in front of house. Man gets out. Truck says Master State on door. Man helps women out of back of truck. Delivery driver rings doorbell of house. Man answers door. Delivery Guy In Yellow Outfit Ring A Doorbell To Deliver Food Boxes. Smiling Woman Take The Pizza Boxes And Thanks The Courier By Giving Him Money.